Why do employees leave, and why do they stay? Just ask them. They’ll tell you. Check out these real employee survey comments to find out what employees really think about how they’re treated at work. It’s not difficult to see why they’d leave or stay. 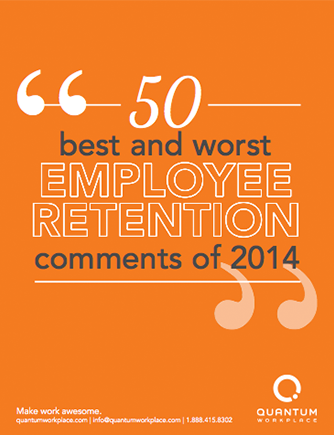 These 50 employee quotes highlight the best rants and raves of survey comments, collected from the feedback of nearly 400,000 employees surveyed through Best Places to Work. They have no problem being candid and telling the real story. Enjoy reading the comments, and share them with your coworkers and friends.